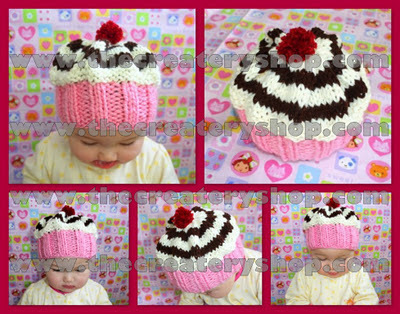 What is sweeter than a knitted cupcake hat with swirls? The baby you put it on! - Hat brim circumference is 14 inches. - Fits 9 month olds to 3 years old (head circumferences between 15-20 inches). - Knitted with the softest acrylic yarn. Please feel free to contact me if you would like this hat made in a different color or size. I can do it for you! I personally design and create all my knitted items. Item is shipped 1-2 business days upon receiving payment, and will arrive within 5-10 business days within Canada and USA. Hat is made in a smoke-free environment and shipped securely in an air-tight and waterproof packaging bag with bubble wrap envelope to ensure your item arrives in perfect condition.